We concluded the 149th General Assembly on July 1st. Once again I was faced with a myriad of challenges to ensure a fair and open government that serves the needs of all Delawareans. My allegiance to you and your families is unwavering. You are the only “special interest” I am committed to. I have an opponent once again this election and if you agree that I have served in your best interests, I will need all of you to come out on November 6th to vote for my re-election! We passed some significantly effective legislation this year that helps families and the middle class. We passed the first leg of a constitutional amendment to guarantee equal rights for women in Delaware and passed a paid family leave period for state workers that will support many of the growing families in Delaware. I was particularly proud to be a primary sponsor who led the fight to restore the Pharmaceutical Assistance Program that benefits the elderly and neediest members of our state. I also was honored to sponsor and help pass legislation to create a lethal violence protection order that could take away someone’s firearms if they are deemed to be a threat to themselves or others (HS 1 for HB 222). I am continuing my efforts to reform Delaware’s LLC laws that allows limited liability protections for businesses but has been used in some instances to create companies that have laundered drug and terrorists assets and been used in human trafficking. I also had the privilege of working with members of the Southridge Condominium Association and residents of the surrounding communities, Arbour Park and Academy Hills, among others, to prevent the deforestation of eight acres of old growth trees and vegetation along West Chestnut Hill Road and Independence Way. This would have caused significant harm to the surrounding area including storm-water runoff problems, increased traffic congestion, and irreparable harm to the environment and quality of life of the surrounding area. Additionally, I am pleased to announce a recent settlement that will significantly benefit all Delmarva (DP&L) electric ratepayers. I will explain in further detail later in this newsletter. I will continue to fight against taxpayer giveaways to the wealthy corporations at the expense of the middle class. We must institute a fair tax structure that will allow working people to subsidize their own families and not huge corporations. We must restore the drastic cuts we have made to public education funding that continue to be imposed by this administration. A common thread running through the problems we encountered this last session was a continuing lack of transparency by the executive branch and other state agencies. FOIA requests for records of meetings and decision making discussions have been routinely denied by the Governor’s Office and requests for relief have fallen on deaf ears at the Attorney General’s Office. Without full transparency and openness in the government’s decision-making process, we, as legislators, cannot and should not expect to have the public’s confidence and trust in the policies we create and the decisions we make. Over the last ten years, Delaware has given hundreds of millions of taxpayer money to the world’s wealthiest corporations. I will need your help convincing my fellow legislators that we instead need to dedicate money to encouraging and assisting growth in smaller Delaware based companies to allow our small businesses to prosper, expand, and provide thousands of new jobs. These are some examples of how important it is to have a government that is open and transparent. The advantage to having many sets of eyes reviewing the decision-making process and the policies that result is that critiques and improvements can be made to ensure the benefits and identify the potential harm. I intend to bring full transparency to government and engage the public in every aspect of policy making. I will always work on behalf of you, my constituents, and in your best interests, regardless of pressures brought to bear by “special interests.” As I near the end of my sixth term as your State Representative, I realize my responsibilities to you and your families is of paramount importance and the reason you have put your faith in me at election time. I will never betray your trust and will make sure your voices are heard. There is much to do and many more obstacles to overcome. You have my word that I will be resolute and determined in facing the challenges and fighting for you, your families, and in the best interests of all Delawareans. I will need your vote on November 6th to allow me to continue investing in your future. As always, when looking at any proposed tax or fee increases, I consider whether or not they are regressive and how significantly they could disaffect families who are already struggling with the current economic situation. A recent proposal (HB 460) to amend the constitution failed to pass but Governor Carney issued and signed an executive order to circumvent the will of the legislature. In fact, HB 460 is an attempt to impose a “Balanced Budget Amendment” that will establish certain budgetary constraints to force the services and programs of the most vulnerable Delawareans onto the chopping block regardless of the intent of future legislatures, and it will establish regressive taxation policies that will hurt working families, small businesses, and poorer workers. 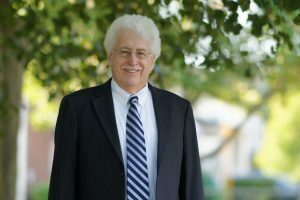 The proposed bill is a recommendation from the unelected and unaccountable Advisory Panel to the Delaware Economic and Financial Advisory Council, which even has the audacity to suggest taking away deductions from Delaware taxpayers as a way to reform personal income tax without any consideration on the impact to ordinary families, individuals, and small businesses. This is one of the most regressive taxation reform proposals I have witnessed. Under Executive Order #21, the necessary social services and support programs for the neediest will be the first to be cut back and suffer the most severe consequences if there are across the board cuts. As mentioned earlier, we did restore the Pharmaceutical Assistance Program that benefits the elderly and neediest people. If you were a member of this program before it was cut from last year’s budget, then please call 1-800-996-9969 (option 2) to requalify. Our failure to confront the real possibility of another banking crisis/failure is a cause for grave concern and as a member of four National Conference of State Legislators (NCSL) committees, I have offered resolutions to reinstate a modernized Glass-Steagall Act across the states. 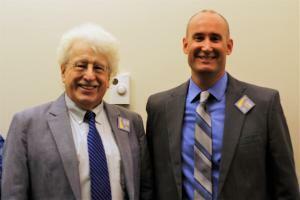 John with Public Advocate Drew Slater, who successfully fought for a huge rate reduction for Delmarva customers. I have continued my practice of intervening in rate cases important to you that are brought before the Public Service Commission. As a direct result of my involvement and the 38 signatures I gathered from my fellow legislators supporting the Public Advocate’s efforts, I am pleased to announce a recent settlement that will significantly benefit all DP&L electric ratepayers. I chose to intervene in PSC Docket # 17-0977 in order to join the Public Advocate, Drew Slater, in mitigating the proposed increase in electric rates requested by Delmarva. The original rate increase request was for $31 million. After the recent corporate tax cuts were passed, the Public Advocate, supported by me and my colleagues, filed a petition to capture that corporate windfall and give it back to the ratepayers. After months of negotiations, a settlement was agreed to that resulted in the original $31 million rate increase request being reduced entirely and a $6.8 million credit given to the customer base. The credit amounts to a $15 per year (1.4%) decrease in the typical customer’s bill. This reversal totaling nearly $38 million is extraordinarily good news for ratepayers and a special note of appreciation should be extended to Public Advocate Drew Slater for his remarkable efforts in this matter. I would like to also extend my thanks and appreciation to Representative Kim Williams and all other General Assembly members who signed the letter of support. I also expect similarly good news in the matter of PSC Docket # 17-0978 (the application of DP&L for an increase in natural gas rates) that will result in savings for natural gas customers. I am determined to represent your interests to prevent higher utility bills from eroding the economic stability of your family budget. As a member of the House Energy Committee, I will continue to address issues affecting your family’s health, the environment, and the economy. As an active member of the National Council of State Legislators (NCSL), I have participated in many forums and panel discussions about the effects of fossil-fuel dependency and the failure to confront the real possibility of another banking crisis/failure. As a member of four NCSL committees, I have offered resolutions to reduce fossil fuel subsidies, prohibit expansion of off-shore drilling, and provide funding for renewable and clean energy sources. The proliferation of corporate education reform agendas continues to drain needed financial resources from public education and deposit those monies in the for-profit sector. 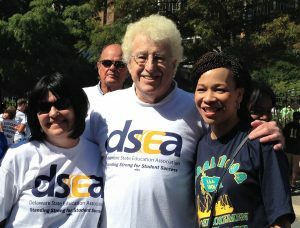 Rep. Kim Williams, John, and Congresswoman Lisa Blunt Rochester on Labor Day with Delaware State Education Association (DSEA). Recent education policies and laws have caused a great deal of conflict and confusion. The result is a failure to focus on fundamentals and the needs of students. A recent proposal by the Governor will close some neighborhood schools in Wilmington that have become comfortable, familiar, and accessible places for parents, grandparents, and their children. The plan to refurbish two monolithic buildings to house K-8 Wilmington/Christina students in a less-than-welcoming environment will not promote a better learning environment for these kids and could result in more adversarial conditions and less individual attention, and also impede families from participating in that educational experience. I asked the Governor to use the proposed $15 million for the poorly thought out venture to instead restore the $36 million in cuts to public education his administration imposed and to hire full-time Reading and Math Specialists for those neighborhood Wilmington schools. The impact of Reading and Math Specialists assigned to struggling schools has shown to be an unqualified success in helping educate young students. The Delaware Department of Education and State Board of Education continue their misguided efforts to judge educators and student performances based on an unproven system that could mischaracterize good teachers as ineffective while completely failing to identify the educational needs of the individual students. The adoption of the Smarter Balanced Assessment Test, an unproven and potentially harmful exercise, comes with a huge price tag and no obvious way to identify children’s potential or needs. I will concentrate my efforts on trying to correct the inconsistencies and vagaries in our education laws to allow a true, available choice for all parents while preserving the intent of alternative programs such as charter schools to flourish as laboratories of innovation that can be replicated in traditional schools. I have visited many schools in the 25th District and throughout Wilmington and have witnessed some extraordinarily successful programs. These successes are due to the highly qualified and dedicated teachers and administrators in those schools and the willingness of the students and parents to partake of those advantages. My personal measure of the success of any public education system is that to be considered as successful, an education system must provide the opportunity for all children to reach their full potential. Anything short of that can never be satisfactory or acceptable. During the 149th session, I sponsored numerous pieces of important legislation. One of the more important to me was HB 331. 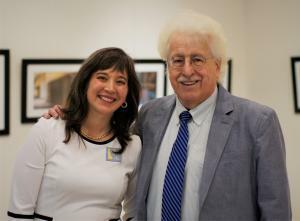 John with Amy Roe, environmentalist extraordinaire who made the lead paint ban a reality. HB 331 – This bill passed both chambers unanimously and awaits the Governor’s signature. Motivated by the untimely passing of their son, Michael, Bonnie and Chuck Yeatman asked for legislation to help ensure other parents do not suffer the loss of a child. This bill creates regulations concerning the use, distribution, and education of benzodiazepine and non-benzodiazepine hypnotics. It requires practitioners to obtain consent from a minor’s parent or guardian prior to prescribing these drugs, and requires pharmacists to include a cautionary statement explaining the risks associated with the use of these drugs. HB 456 – This bill, also passed unanimously, amends the Delaware Code to prohibit the use of lead paints on outdoor structures such as bridges, water towers, playground equipment, highways, parking lots, and utility towers and poles, in order to protect public health from the dangers of such paints. This bill will enable a cleaner and healthier environment in Delaware. Special thanks to community activists Amy Roe and Sarah Bucic for their persistence in passing HB 456. I also introduced significant legislation which passed the House unanimously but did not reach the floor in the Senate. Some bills were held in committee and not placed on the agenda. With your support this November 6th, I will be reelected and can reintroduce the following important bills. HB 479 – This bill prohibits the manufacture, sale, or distribution of upholstered residential furniture and children’s products that contain harmful flame retardant chemicals. People who are not in the business of selling these products and nonprofits are exempted from this Act. These flame retardants have been found to cause cancer, particularly to firefighters who are extinguishing fires. HB 72 – This bill removes the broad exemption that the University of Delaware and Delaware State University currently receive under the state Freedom of Information Act. HB 71 – This bill adds appointed members of the Cash Management Policy Board to the definition of “public officers.” This designation would subject the appointed members of the Board to annual financial disclosure requirements since they handle over $2 billion in State investments. HS 1 for HB 57 – In an attempt to obey federal law, to coordinate with the federal law enforcement agencies, and to assist Delaware registered agents who form LLCs to avoid severe federal fines, this bill attempts to prevent the use of our Limited Liability Act by persons, businesses, groups, and nations identified by federal agencies as a threat to this country and its laws. Once again leadership stalled legislation that would have provided a fairer tax for everyone by creating two additional brackets for the wealthier while keeping the middle class earners whole. These were HB 107, HB 108, and HB 109. I serve on the Energy Committee, the Health and Human Development Committee, the Natural Resources Committee, the Labor Committee, and the Manufactured Housing Committee. As my 25th District constituent, you have access to a lot of influential committees, and I welcome and encourage your input and ideas to facilitate that advantage. 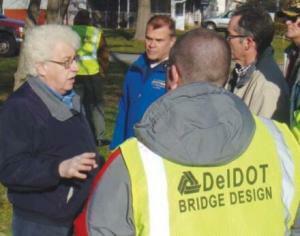 John visiting areas with DelDOT for necessary street repairs. I continue to evaluate street conditions with an on-site personal visit to assess the need for street repair and storm-water relief projects in order that all funds administered from the Community Transportation Fund will be spent effectively, judiciously, and where needed most. Some projects of note have been funded and some completed and others are being cost-estimated so that I can dedicate their funding. Projects that have been funded are Myers Road and Havertown Road in Robscott Manor, Greer Drive and Godwin Drive in Elwin Manor, Cornwall Drive and Plymouth Drive (with Senator Sokola’s help) in the City of Newark, Edjil Drive in Catalina Gardens, Winsome Way in Pencader Village, Knights Crossing in Beaulieu, Cobble Creek Curve from Phoenix Avenue to Pebble Place, and parts of Four Seasons Parkway. After two years of effort, I have managed to negotiate and fund a four-way stop sign placement at the intersection of Edjil Drive and Janice Drive that will allow a safer crossing for students at neighboring McVey Elementary School. I am also awaiting estimates for projects that I will fund for the upcoming construction season that will include Winsome Way at 896, Snowflake Road (in back of the shopping center), and a portion of Harkfort Road and Four Seasons Parkway. I expect to fund a major repaving of Biscayne Boulevard in Palm Springs Manor as soon as needed paperwork is finished. The State continues to offer one of the most effective programs to assist Delaware seniors, and I continue to support this important policy. The New Castle County School Property Tax Credit Program, financed by the State, is very successful at reducing the tax burden on eligible senior homeowners. If you are 65 or older, you can apply to receive credit for your school property tax. This program is based on age not income. Once you receive the credit, you do not have to reapply each year. The State of Delaware will pay 50% of your school tax bill, up to $400. To be eligible, you must have turned 65 by June 30th in the year that you are applying for the tax credit, and you must apply by September 1st. For an application, please contact the County Assessment Division at (302) 395-5520, and also ask about New Castle County’s property and sewer tax reductions dependent on income. ELDERinfo (now known as Delaware Medicare Assistance Bureau): This is Delaware’s State Health Insurance Assistance Program. It is designed to assist seniors with Medicare and general questions and concerns. They may be reached at 1-800-336-9500. Delaware Prescription Assistance Program: The Delaware Prescription Assistance Program, recently restored, will assist low-income seniors with the costs associated with prescription drugs. To see if you qualify, please call 1-800-996-9969, option 2. The Delaware Helpline Can Help You: Call 1-800-464-HELP for information on state government agencies and referrals to community resources. Cancer Care Connection: This non-profit organization helps patients, family members, caregivers, and friends in locating a wide range of services at no charge. Coping assistance and professionally trained cancer resource coaches are available toll-free at 1-866-266-7008. Senior Roll Call Lifeline: The Roll Call program is run by the New Castle County Police and provides a reliable, daily telephone call to seniors. Every morning you will receive a phone call from the program. When you answer the phone, a prerecorded message will ask if you are OK. Just hang up the phone and the computer will note all is well. Please call (302) 395-8159 to learn more about this free program. Newark Senior Center: The Newark Senior Center provides wonderful services and a wholesome environment for seniors. If you are a senior, you should join to take advantage of its services. If you are not a senior, I hope you’ll consider volunteering to help with its activities. 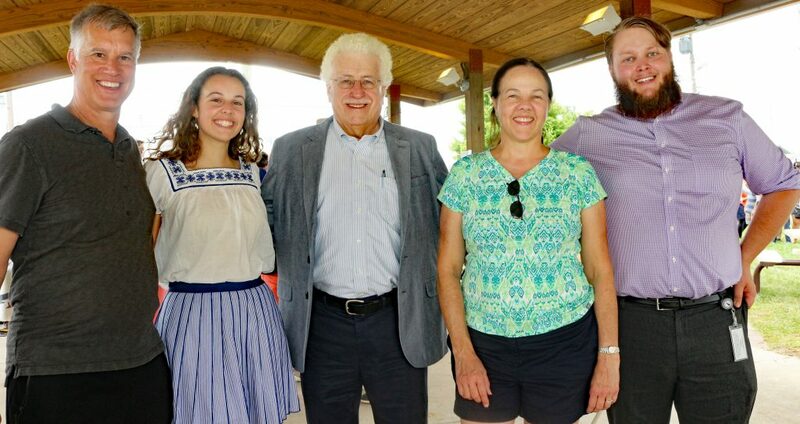 Lily Peterson was chosen as one of the winners of Delaware’s 2017 Young Environmentalist Awards. My pledge to all of you is that I will never abdicate my ultimate responsibility, as your elected public servant, to meet any and all constituent needs. I try to make myself available any day and at any time, not only to listen to your suggestions, complaints, and concerns, but to hear and respond to your needs. Ultimately, I am responsible to all my 25th District constituents and all citizens in Delaware because I work for you. I accept that responsibility and take those tasks very seriously and enthusiastically. If I cannot answer your concern, then I will find someone who can. If you find yourself in need of my services, please call my office at (302) 577-5321, or my home number at (302) 737-2396. 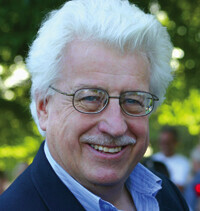 If it is an emergency matter, you may leave a message on my home phone or email me at john.kowalko@state.de.us. I personally check my emails several times daily. If you are elderly or do not use email or need an immediate response that is time sensitive, please call my cell phone at (302) 547-9351. I want to thank all of you for your responses to questionnaires in the past. This year I am posing five questions for your consideration and hope you will respond to them by submitting the form below. If you would like to receive occasional emails from me with information important to the 25th District, please include your email address and I’ll add you to my list.